A teacher's aide working with autistic kids has a rewarding career that serves a very important purpose. Whether you are considering entering the field or you simply want information about your child's classroom experiences, knowing the role of the teaching assistant in an autism support classroom can help. What Is a Teacher's Aide? Some teaching assistants specialize in special education, offering additional support and skills including working with autistic children. A teacher's aide working with autistic kids typically has duties related to the children's treatment plans in addition to the routine classroom responsibilities. Tasks vary according to the classroom environment, the number of autistic children in the class and the Individual Education Plan (IEP) for each student with special needs. Children on the autism spectrum of disorders have a wide range of abilities, and the ideal educational environment varies according to the severity of impairment. Children with low functioning autism may attend special schools and students with high functioning autism or Asperger's syndrome may attend mainstream schools. Early intervention classrooms usually have more than one teaching assistant in the classroom, depending on class size and mandatory adult-to-student ratio. Students are preschool age and duties may include assistance using the bathroom in some cases. 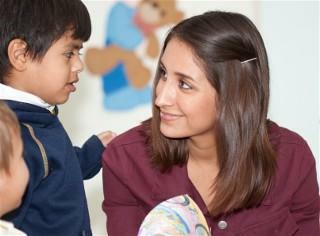 Autism support classes can be in mainstream schools. The students go to class with their classmates but spend a portion of the day in the support class separate from the other kids. Special education institutions are not mainstream schools and students are usually relatively low functioning. Multi-disabled support classes offer help with gross motor, fine motor, interpersonal relationships, visual, auditory and communication skills. Mainstream classrooms include students of varying abilities including those who need special education programs for accelerated learning. Some mainstream classrooms may allow therapeutic staff support (TSS) to provide additional behavioral support in some cases. The role of the TSS differs from the teacher's aide. What is the difference between a teacher's assistant and therapeutic support staff (TSS)? Typically, a therapist working in the classroom is focused on one student's behavioral and sensory needs. The interventions used by the TSS are behavioral in nature. No academic guidance is involved because the support staff is not an educator. A TSS may be assigned to a child's classroom on a temporary basis. Usually, an agency employs the therapist, not the school district. The staff support uses the least intrusive measures to provide behavioral support. Ideally, the therapist works in the classroom for a few months before the services are not necessary anymore. The qualifications for becoming a teaching assistant working with autistic children vary according to the school district's requirements. Some teacher's aides that work with kids on the spectrum have little or no training specific to autism and must learn through experience. Some school districts offer workshops and training for teachers as well as aides. The role of a teacher's aide working with autistic kids is difficult to pinpoint considering the many variables that may come into play. It helps to learn as much about pervasive developmental disorders as possible if you work in the field of education. The prevalence of autism makes the chances of having a student on the spectrum in the classroom very likely. Parents, teachers and teaching assistants can benefit from attending workshops offered in their region.